Is your life a little too busy these days? 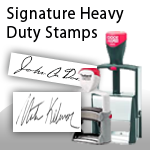 Cut some time out of your day with Personalized Signature Stamp. How much easier would your life be if you didn’t have to apply your own personalized signature to everything by hand? 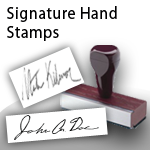 Our technology allows you to seamlessly add your personalized signature stamp to everything you need to sign. 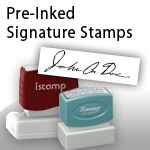 Re-inking technology means that the perfect layer of ink is on your personalized signature stamps with every use. The swivel action inks the signature stamp instantly and consistently every time you have to stamp your personalized signature. Remember the old days when you had to get out the stamp pad and then signature stamp it a few times on a blank piece of paper to get the right consistency? Your first personalized signature stamp would be bleed together if you didn’t run the test. Then, you only got a few good stamps before the ink started to fade. We know the struggle. We also remember the days when you had to literally write it out yourself with your own hand. If you had hundreds of personalized signature stamps to go through in a day, you were asking for cramps. Also, it took time out of your day rather than doing more important things. That’s how importantly personalized signature stamp is. You can’t do business these days without them. Put it right on your desk and watch how much time you save with personalized signature stamps that are ready to go at a moment’s notice. No need to take time for anything else. Simply stamp and move on with the rest of your day. No need to set aside a few minutes to an hour to complete a task that can virtually take less than a second. 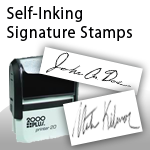 Get your personalized signature stamp today! Just remember IdealStampShop.com, your source for personalized signature stamps. Also, have a look at address stamps & hand stamps here.